A booklet written by Anna Powell celebrating the work of Richard Batterham at 80 offers fascinating insights into both the potter and his work. Based on a series of interviews and discussions, it is published to coincide with a new exhibition of Richard’s work at Slader’s Yard in West Bay. ‘We use Richard Batterham’s pots every day. They bring us so much pleasure.’ Comments like this have poured in from people all over the world ever since we started showing his work at Sladers Yard. Richard Batterham is a beacon of hope for those of us who despair at the way craft is heading. As ceramic departments close in schools and art schools, and children are growing up without learning the pure pleasure of using their hands, it seems that objects are regarded as lesser artforms if they have a function. Yet here is the internationally acclaimed Mr Batterham whose unmarked earthy practical pieces celebrate how wonderful pots can be when you hold and use them every day. Richard has been working quietly and industriously just outside Blandford since 1959. Whether it is his ambitious exhibition work or more scaled down domestic ware, his pots have a purity and elegance that is deeply satisfying. His pleasure in making is that of someone who does something very well with absolute concentration. ‘You get into the right frame of mind and just do it,’ he says as if that was the simplest thing in the world. ‘What is that frame of mind?’ I asked him once. ‘You have to get rid of your ego,’ he replied. Richard Batterham’s pots are a direct link back in time to the greats at the beginning of the British Studio Pottery movement, Bernard Leach and Michael Cardew, and beyond them to centuries of traditional English pottery. Pottery that was functional, beautiful and often quietly made by craftsmen whose names have been forgotten. Shoji Hamada and philosopher Yanagi Sōetsu, had coined the word Mingei meaning the hand-crafted art of ordinary people. In his seminal book The Unknown Craftsman: A Japanese Insight into Beauty released in UK in Bernard Leach’s own adaptation in 1972, Yanagi put the case that real beauty is to be found in craft made before the culture of individualism became current, craft that was made over and over again by workers in a culture of ‘modesty, restraint and inwardness, an aesthetic based upon simple naturalness and reverence.’ This quiet way is how Richard makes his pots, and it is the reason they shine out in our egocentric world. Richard was born in 1936. His father taught at a prep school in Surrey that was evacuated during the war to Whatcombe House, a large fine eighteenth century house outside Blandford. Later Richard went on to Bryanston school, where he spent a great deal of his time making pots. His teacher, the appropriately named Donald Potter, was a student of Eric Gill who had also worked under Michael Cardew at Winchcombe. At the Leach Pottery, Richard also met Dinah Dunn. Six years his senior, she had been to art school and worked under Bernard Leach for six years. Jaundice kept Richard in bed most of his second year at St Ives. Once he recovered, at the age of 23, he returned to Dorset, with Dinah, to set up his own pottery outside Blandford. Working alone, Richard’s skills are not being passed on. 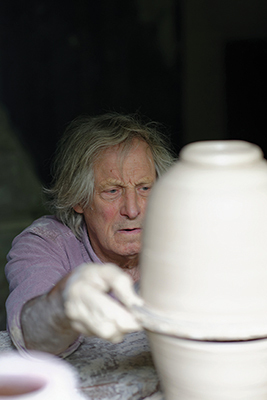 His youngest son Reuben is a potter in France with five sons of his own. Reuben has recently been over and helped Richard to fire the salt glaze kiln. ‘He’s better at salt glaze firing than I am,’ he says.